Launched in September 2016 by Health Minister Michelle O’Neill the Dementia Learning and Development Framework has been developed to enable health and social care staff deliver the best quality of care to people living with dementia, their families and carers. The framework was produced in response to a commitment made in Improving Dementia Services in Northern Ireland. It identifies the expertise and skills health and social care staff need to respond sensitively to the needs of people living with a dementia. 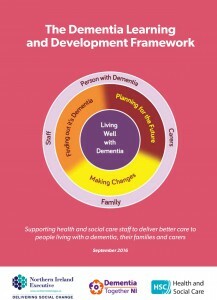 Click here to view the Dementia Learning and Development Framework. Funded jointly by the NI Executive and Atlantic Philanthropies, under the auspices of Delivering Social Change, the framework applies to all employers and educational organisations that provide training to health and social care staff and students. The Dementia Learning and Development Framework is the culmination of work by staff, academics and regulators. Most importantly, people living with dementia and their carers have been vital to its development. To hear their views on the framework watch the following short video. Dementia Learning and Development Framework from HSC Board. Improving understanding of dementia for people in the caring professions ensures that people with dementia receive better levels of care, treatment and support. The provision of general and specialist training for all staff, across all levels, is essential in challenging the stigma that exists around dementia. The framework allows staff to assess their training needs and will enable educationalists to build on current good practice and design more effective training programmes.